Motorola has created a slideshow that provides and excellent overview of the Motorola MC9500-K rugged mobile computer, it’s features and benefits. Click on the image below to view the PDF. The Enterprise Mobility Solutions business of Motorola, Inc. announced its 802.11n wireless LAN (WLAN) solution has been deployed at Memorial Medical Center (MMC) of Western Michigan, a community hospital located in Ludington, Mich.
Motorola’s innovative WLAN technology will enable end-to-end voice, video and data mobility across the entire healthcare facility, helping improve patient care, boost productivity and increase staff satisfaction. Patients and guests will also benefit from the new 802.11n wireless network by gaining high-speed Internet access, so they can stay connected while visiting the hospital. The Motorola MK4000 micro kiosk equips enterprise organizations with a variety of interactive self-service features for customer- and employee-facing applications to help redefine the shopping experience. The new MK4000 is a multi-functional micro kiosk that enables enterprises to put the power of self-service in the hands of the customer. Delivering an interactive customer experience, the MK4000 is well-suited for businesses looking to better connect with customers, increase employee productivity and in some instances to help ensure compliance with local government regulations. The versatile MK4000 micro kiosk is ideal for a multitude of service-driven industries. On the retail sales floor, customers can check pricing, verify gift card balances, order a product from the store website and print out personalized coupons without waiting for assistance. In airports, car rental offices, stadiums and theme parks, the MK4000 helps speed customers through check-in without a long line at the gate or counter. In the hotel lobby, the kiosk serves as a personal electronic concierge, helping guests with check-in/check-out, restaurant reservations, turndown service and more. Patients in a hospital or clinic can use the self-service kiosk to check in or schedule an appointment. In addition to a customer self-service kiosk, the MK4000 can act as a workforce management tool as well as a promotional point of presence. For example, employees can view training videos or presentations on new products or policies, punch in and out and access on-demand information to assist customers. In customer-facing areas, when the multimedia kiosk is not in use, it can also play videos to promote company branding, advertise upcoming events and offer customers value-add information. Motorola, Inc. today announced the MC9500 – a premium industrial-class handheld device that takes mobile computing innovation to the next level to further increase productivity, streamline operations and reduce total cost of ownership. 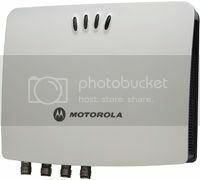 Motorola has introduced a new series of business-class fixed radio-frequency identification (RFID) readers. The Motorola FX7400 series provides maximum functionality in a sleek package that is less than half the size of traditional fixed RFID readers, making it ideal for retail stores, offices, and other customer-facing or business environments. Motorola’s new cost-effective, high-performance fixed RFID reader is built on a new platform that supports Gen 2 technology and is capable of hosting third-party, customer-driven embedded applications. The Motorola Snap-On Mobile Payment Device turns the Motorola MC70 and MC75 mobile computer into an instant point of sale (POS), enabling employees and associates inside and outside the four walls to improve service, productivity and sales in retail stores, hotels, car rental agencies, package delivery routes and more. With secure wireless LAN (WLAN) and wireless WAN (WWAN) connections to banking, CRM and other backend systems, this versatile three-track device allows workers to process credit and debit cards as well as driver’s licenses and loyalty cards in real-time for on-the-spot payment processing and more.